Our female Pekin duck (I call her Streaky-Beak because she has a few stripes on her snozz) has been sitting on a nest of eggs under the barberry hedge on our far boundary for at least a month. It’s her second crack at motherhood (our puppy defeated her first attempt last spring when he found her nest under the conifer shelter belt and ate all 14 eggs in one go). But given how cold it has been getting at night here now, I didn’t hold out much hope that she’d be able to keep the eggs warm enough to hatch. In fact, just yesterday I was thinking I really should get her off the nest before she loses all her condition before winter. Baby ducklings are so adorable. Unfortunately, they’re also appetising to hawks. We rounded up the ducklings before breakfast, then turfed the chooks out of the chook run and locked the quackers in there as a temporary measure. Ten minutes later, I saw the first hawk swoop. My maternal instinct kicked in (I went a little bananas) and I rushed out in my slippers to scare it off. So now the ducks are safely ensconced in the haybarn instead and Dad’s on his way over to give us a hand to rig up a temporary mesh run out the barn door. Meanwhile, my haw jelly stuck to the pot. But who cares? We have a box of Easter fluffies! i agree, you can’t beat ducklings! their colour indicates they are all girls as well? Score! I have 2 silver pencil wyandotte bantams that are wonderful at detecting the hawks before they come into site. The Wyandottes are great mothers and will protect those ducklings for you. I have some French Houdans which the 2 wyandottes hatched the eggs. The Houdans can’t see that well because of there great hair do’s so the wyandottes make great mothers to them as they are always listening out. They just make this great high pitch scream and the houdans just run for the hills. So far we have managed to keep all safe including the polish bantams. Wyandottes are an American bird and almost have an identical look to the eagle. We just successfully raised 10 khaki campbell ducklings. We had a teenage mother duck who was more interested in food than her babies, so we locked them in a small cage together, and provided them with food and water, mum provided the heat source and we now have ducklings who are getting their proper feathers – very cute and lots of fun! My grandmother had Khaki Campbells. They’re the best layers I think. What a ‘special Easter Surprise’ Lynda. They look so soft and cuddly. So pleased you were able to save Mum and her precious babies from the Hawk. (I would have done the same. Over the years, I have nurtured many baby birds, and in days gone by, ‘Lambs.’too. Hi Lynda, oh aren’t they gorgeous!! We have loads of pekin ducks and some khaki campbells too. I live in Nelson and grow herbs and tomato plants for Heather at Mapua Country Trading. We gave her about 9 (I think) of our ducks a few years ago and I vaguely remember telling me she gave 6 to someone, but I’m not sure if it was you?? I just love our pekins and they are a constant source of joy with their quirky characteristics.. um.. they call me the duck whisperer!! Crikey!! I used to be the garden writer for the Nelson Mail and truly admire you – you remind me of me, so enthusiastic and passionate about what you love. Smiles.. It probably was me. I brought them home on the plane with me (Air New Zealand wasn’t exactly impressed because they stank out Blenheim airport!). 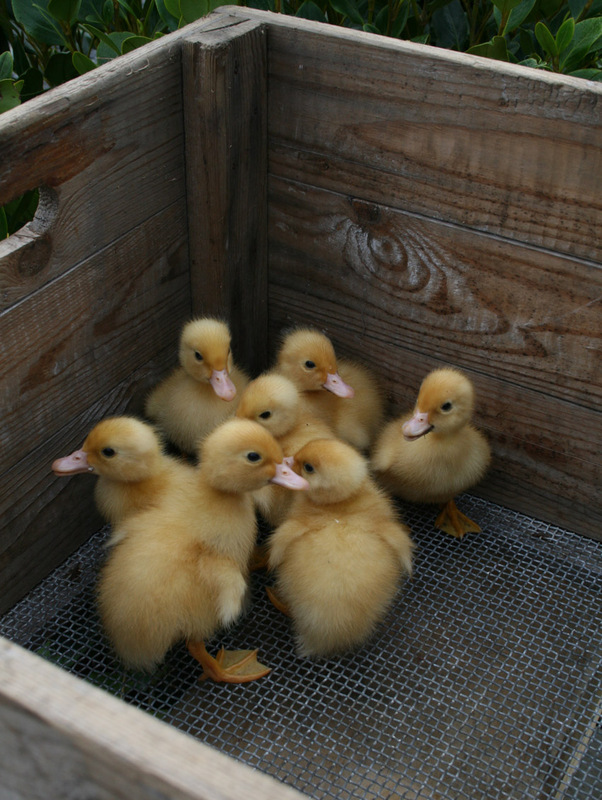 They are adorable – you just have to stand outside and yell “quackers” and they come running. I don’t think we’ll ever actually eat one. We’re down to three adult ducks – I guess the others flew off to greener pastures.